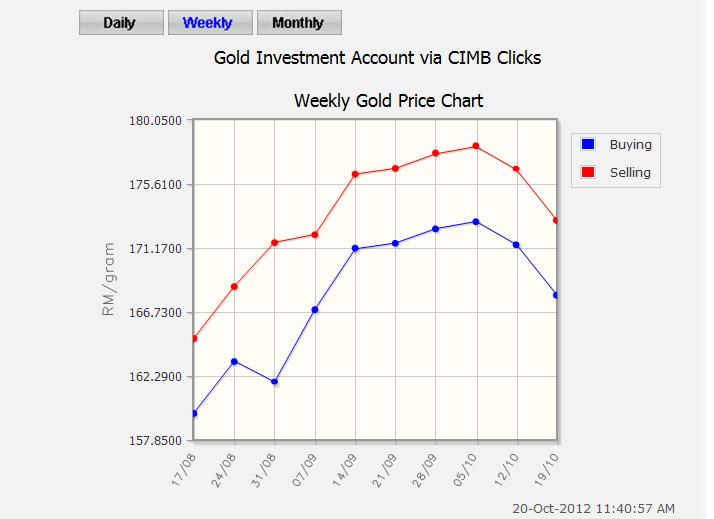 As discussed in my previous post, CIMB introduce an online system for its GOLD investment schemes which is an advantage over their not-so technical updated competitors. 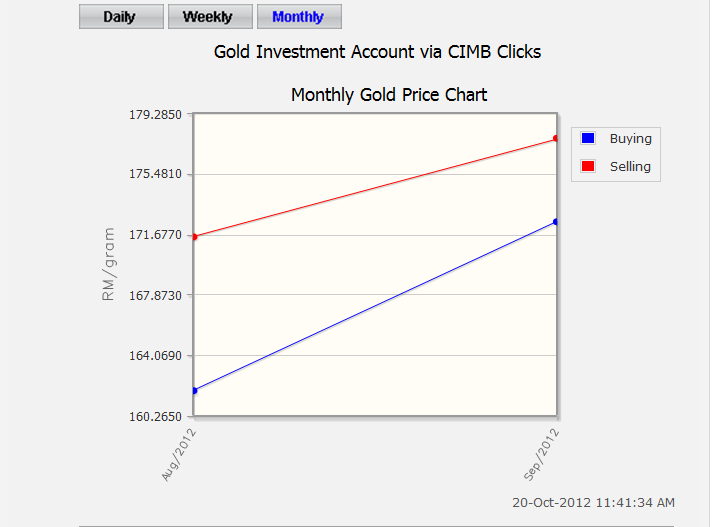 See the post below on how to do GOLD investment via CIMBCLICKs. Since the post was a few months ago, I decided to have a look once more on what is the best entry point to enter the gold investment via CIMBCLICKs. 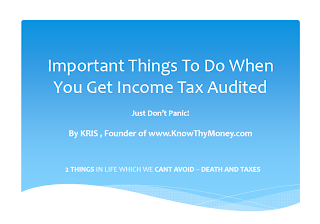 I found one interesting fact that could give you a higher chance of profitable entry point. In the earlier post, you will note that there is no extra expenses incurred when you buy and sell the GOLD electronically. The reason is that the bank already profited from the buy and sell spread differences & also their gold prices are not updated "live" every second of the day. GOLD is traded 24 hours and never sleeps. At first, I thought that the spread will be hovering consistently around ~RM10. For example, RM175.15 - 165.45 = 9.70). Price dated 20 October, see below. Well, the spread is important as it generally determines, at what price you need to sell so that you break even your investment. Higher buy/sell spread means that you will need to wait longer the gold prices to go even higher so that you break even or profit as compared to a lower buy/spread. The Gold calculator allows you to see the price movement for daily, weekly, and Monthly. Did you managed to notice it?? Kudos if you did. The buy/sell spread actually is not fixed aka it actually goes down to below ~RM10 during 14 Sept to 21 September. The spread during that week is roughly ~RM5. Well you might argue that it is not uncommon that the buy/sell spread is not constant. But remember, this online GOLD investment is not like the liquid stocks traded in the stock market where you can see the buy & sell prices changing rapidly based on the principle of supply and demand. 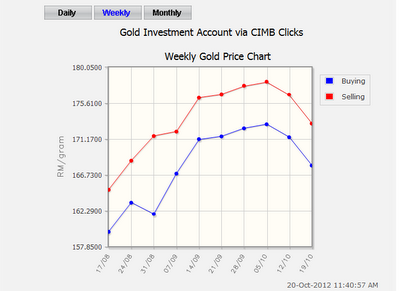 CIMB could have make a lot of pure profit if they just maintained the ~RM10 buy & sell spread. The buy & spread for GOLD traded in the international market is very small because of the supply and demand factor. So in short, I like to go into investment that have small buy & sell spreads so that my investment can break even easily as compared to otherwise.